People who know my family know my husband does his Quest. That’s his term for shopping for Christmas presents for me. His goal is to find the most unusual things he can find because as he said to me once, “the gifts have to be unusual because you’re an unusual person.” Yep, that’s me. One year he came home with seven Hobo Nickels. At their heart these are the old buffalo nickels (also called Indian head) with an American buffalo on the tail side and a Native American man on the head side. But Hobo nickels are more than just their 5⊄ value (or whatever value individual old coins have). They are micro canvases for artistic expression. As far back as coinage goes, if someone minted coins, there was someone defacing them. I’ve found reference to ancient Chinese coins being altered with images of puppets, horses, and elephants. The Victorians were big on love tokens I have two (from my husband’s quest) with faces smoothed away and flourished script carved in its place. These were worn as jewelry or on watch fobs. My husband collects Hard Times Tokens, those odd shop coins that stood in for currency when the nation had it’s first economic Depression in the early 1800’s. He has a few with holes drilled in them so they might be worn like a token or a pendant. In other words, defaced. The Buffalo Nickel was minted at the Philadelphia, Denver, and San Francisco mint facilities and was in circulation from 1913 to 1938. Hobo nickel carving as we know it began in 1913 shortly after they were released to circulation. Collectors know this because more are dated 1913 than at any other time before 1930 suggesting this interesting craft became a fad that year of release. That large face and buffalo on the easily manipulated metal just begged to be altered with penknives and nails. Lore has it these things were made by the hobos of the Great Depression to give in exchange for a bite to eat or a place to sleep for the night. 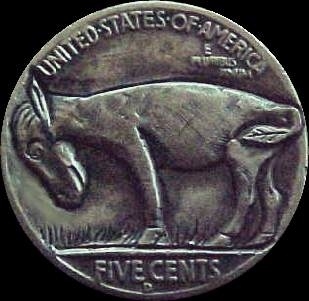 According to some accounts of the time, the nickels were among other handicrafts traded exactly so. Others believe they are called hobo because one of the more common carvings is a bearded man in a shabby hobo-style hat. I’m sticking with the hobo story because some of the coins can be raced back to two artist hobos who met each other in one of the many hobo jungles a.k.a. camps along the rail yards. Bert Wiegand (carving from 1913 to 1949) signed his coins by carving away at L I B E R T Y until he got B E R T. Bert’s buddy and disciple carver was Bo Hughes (carving from1915 to 1980). Bo’s fun creations turned the buffalo into an elephant or a donkey. No longer the artwork of the itinerant rail rider, modern carving is a popular hobby and coin show attraction. It’s estimated that upwards of 200,000 hobo nickels have been made since 1913. Some have sold for more than $2000 a piece. My husband gave me a roll of nickels and an engraver. I think I’ll carve an elephant! Useful to know: the oldest hobo nickels are the ones with the sharpest coin detail, such as dates or lettering. Coins that spent a lot of time in circulation show wear in these areas. 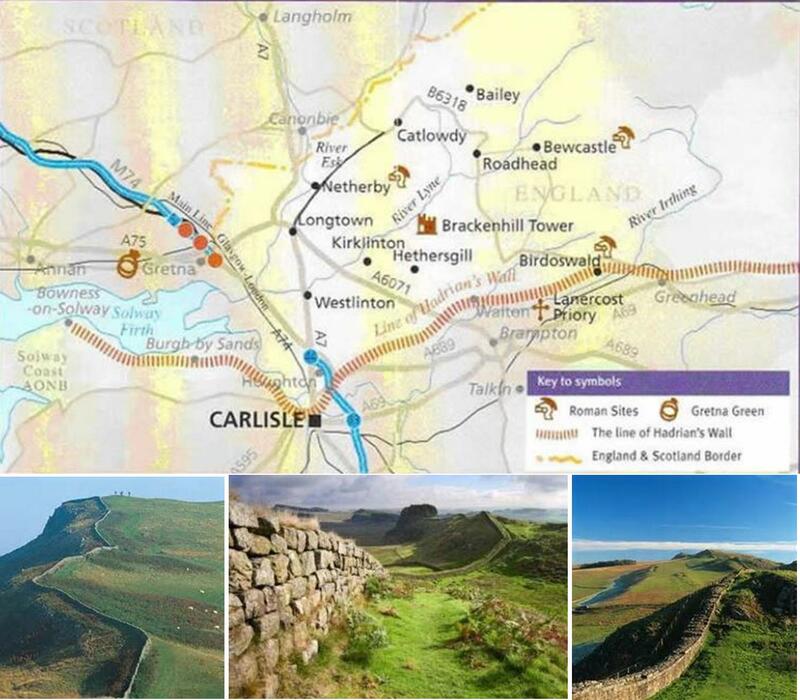 Between northern England and Scotland, running east and west for about 74 miles, Hadrian’s Wall marked the most northerly frontier of the Roman Empire. Named for Emperor Hadrian, it was an attempt to establish a defendable border between southern civilized Britain and the unconquered north. Manned by Roman troops and non-Roman citizen units, the barrier kept the barbarians away. These fearsome peoples were also known as the Picts or Caledonians. You might know them as the lowland Scots. The initial construction took approximately six years, though expansions were made as need presented itself. Like the Great Wall of China, the wall was constructed of the ready materials of the area. Forty-one miles of the wall was built of stone, the rest of turf. Along the way, ditches were dug and ramparts raised, milecastles were added to house soldiers, and turrets were constructed to defend from. The fall of the Roman Empire in the 5th century ushered in the beginning of the Dark Ages. Large sections of the wall fell to ruin and the wall’s necessity to obsolescence. Over time, portions were scavenged for building materials. This piece of Roman occupation was designated a UNESCO World Heritage site in 1987. 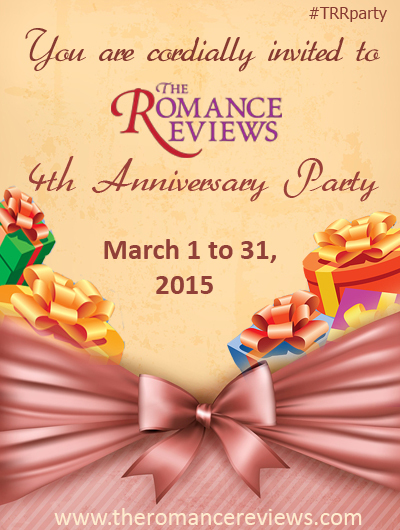 This entry was posted in Past Posts - you'll never know what you'll find and tagged A to Z Challenge, Hadrian's Wall, Hobo nickels, Romance, romance novels, Rose Anderson, scotland, tramp art, UNESCO World Heritage site. Bookmark the permalink.